A simple and fairly by-the-numbers science fiction thriller that stands up to criticism with elegant design, soundtrack and competent cinematography. Debut film for director Caradog W. James, it won the Raindance film festival award for Best UK feature, and the Toronto After Dark awards for Best Actress and Best Sci-fi film, and I imagine there’s a good future for the new director. The story has been explored before; the third act is possibly the weakest part as we know these sorts of moralistic dilemmas revolving around creating a true artificial intelligence. But the opening acts are implemented with a lot of grounding and with moody, contemplative scenes. We see Vincent (Toby Stephens) working with brutally injured soldiers, overseen by shadowy implanted guards who were prototypes of his final project. Everything is draped in shadow but often very well lit and photographed given the budget. Speaking of which, the computer generated effects are used very sparingly and effectively, something a lot of directors could learn a thing or to about. The action towards the third act is exciting and, while maybe a bit hectic, saves an otherwise too familiar screenplay. The acting talent from Toby Stephens and especially Caity Lotz as his assistant Ava are compelling enough to keep you interested. Lotz (Arrow, Mad Men) definitely steals the show by the end of the film, I’m sure we will see more from her in the future. Another good aspect of the characters is that they may go into science fiction cliche, but they don’t throw in romance or needless complications. The soundtrack and a lot of the sound editing reminded me of science fiction such as the Mass Effect series of video games, even some of the visuals made me think of this, which is automatically a good thing in my book. 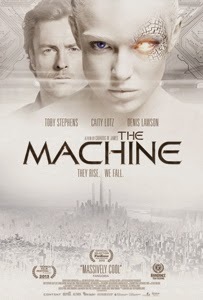 The film’s mood and overall theme reminded me a lot of 2009/10’s Splice, again, not a bad thing to me! I’d give it a watch. Those who love sci-fi will eat up the soundtrack and implementation enough to forgive the familiar plotting, while others should appreciate the simplicity of the storytelling.